My love of horses is no secret and when I come upon equine estates such as this, I allow myself to dream a little. Horses captured my imagination from the time I took my first pony ride at a state fair in Pennsylvania at the age of four or five. I fell in love at that moment despite riding this Shetland pony around only in a circle. Immediately after that ride was a 4th of July fireworks display and I could have cared less…..all I wanted was to go back and ride the pony some more. I begged my Aunt and Uncle to please let me ride some more, but they told me the fair closed after the fireworks display. This farm is beautiful, and of a manageable size. I almost went out to buy a lottery ticket this morning just in case there is a miracle in my future! The farm is to be sold at an absolute auction next week (August 29th), no reserve. Just maybe? A woman can still dream can’t she? I really do miss having a horse(s) in my life even though it is probably no longer feasible. They were such a wonderful part of my life for most of my adult life. 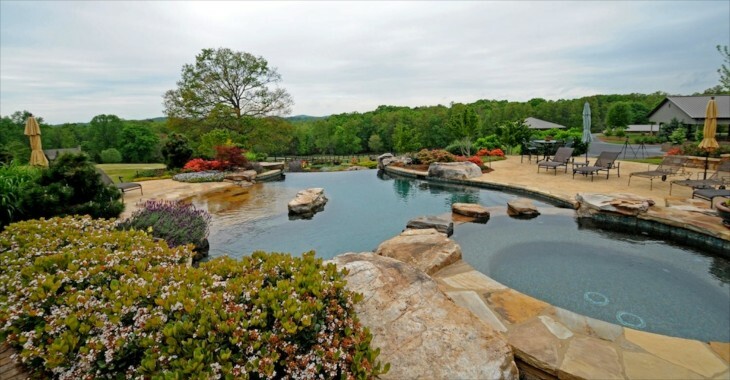 So here we go……by the way….the location is 45 minutes from Atlanta, near Lake Lanier and situated in the foothills of the Blue Ridge Mountains. 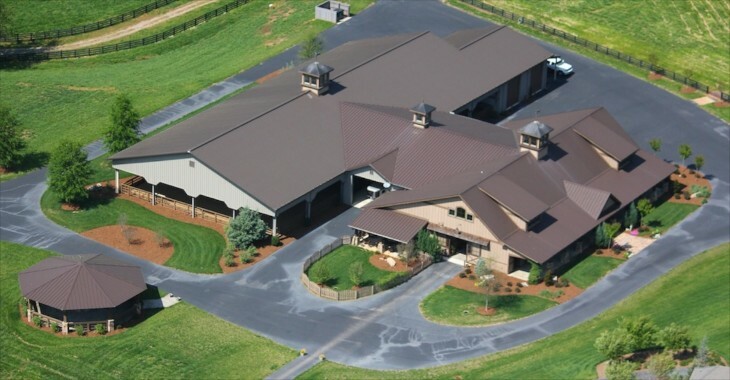 It was built in 2008 at a cost of $12 million, and the amenities for human and equine are impressive. 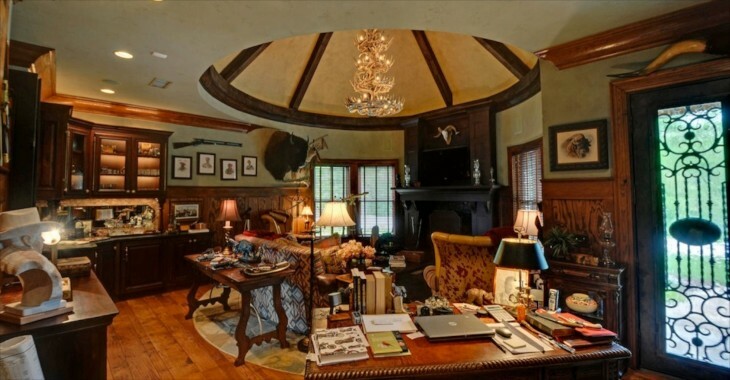 The manor House has 3 bedrooms, 3 full and 3 half baths, kitchen, Great room, Dining, Den. The guest wings has its own kitchen. Manageable. There is also a Pool House, Guest Cottage and the barn. 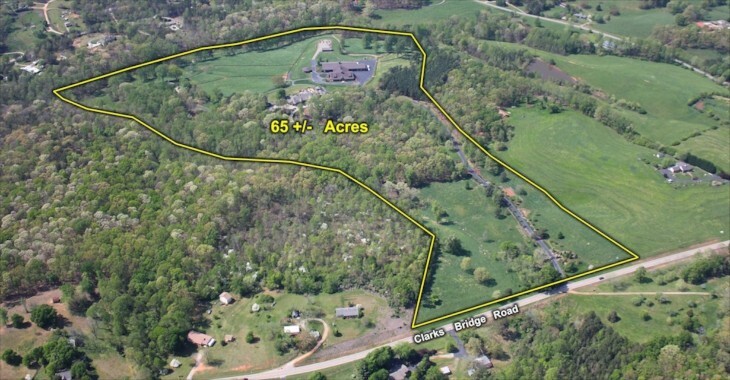 All on a beautiful 65 acre piece of land in Gainesville, Georgia. Additional details under photos. 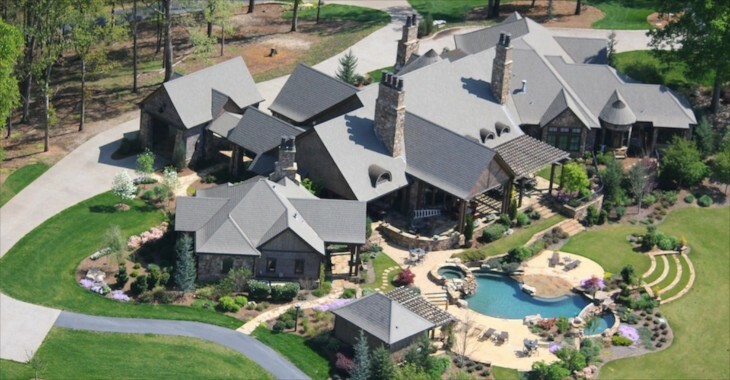 Ariel view of property. I like how the guest cottage really is apart enough from the manor home that a guest would have some privacy. 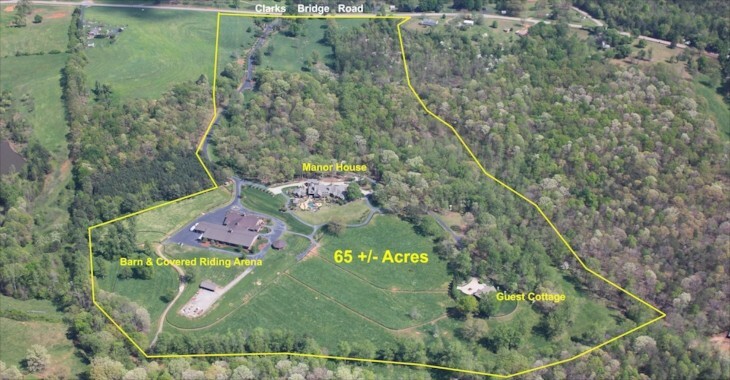 Also, nice balance of woods and pasture. Beautiful landscaping and stone and iron gates greet your arrival, giving a hint of the luxury that awaits. The gates have a security system. You can see from the map above, the drive in is long and winding, with landscaping that includes crepe myrtles along the fenced pastures on each side of the lane. You will come to a fork in the lane, and if you go left you will drive another half mile through the canopied woods, over a fieldstone bridge until you catch a glimpse of the home that sits on a rise. The back of the home with terraced gardens, waterfalls and incredible landscape details. The home is impressive at 8,000 sq. ft., but the Craftsman-bungalow architecture with multiple gables and stone fireplaces scale it down visually. Stone and shingle is always a winning combination as this exterior shows. A view from above. This is one complicated roof for a framer! Included in this view are three separate garages. Out of view are the glass and wrought iron entrance doors, but here you can see the foyer. The brickwork is beautifully executed. 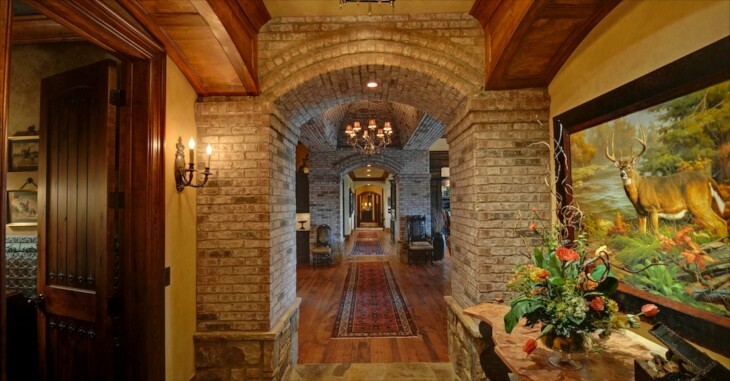 Notice the brick vaulted ceiling above one of the custom chandeliers just past the brick columns. The kitchen includes granite and wood countertops. 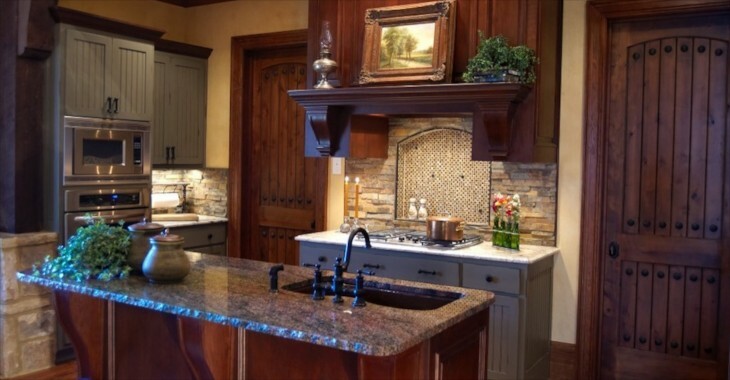 The cabinets are by Habersham, the same company that produces some exquisite furniture. The floors throughout the home are a combination of antique oak and flagstone. At the far end you can see the stone surround where the stove is located. I love the built in shelves there…..so handy when cooking. Two islands can accommodate multiple cooks and large gatherings. Despite it’s size, it feels warm and friendly. The custom light fixtures over one of the islands are really a cool shape. 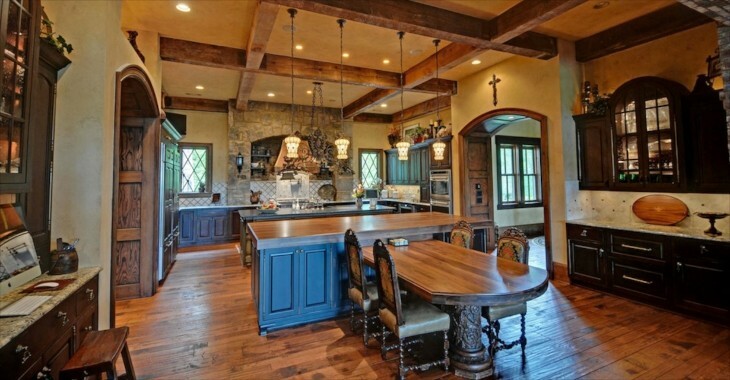 The walls appear to be plaster or stucco.The wood details…..between the rooms, the ceiling beams, the top of one island, and in the column that supports the table bring dimension and warmth. I like the choice of arched door openings. Top of the line appliances by Wolf, sub-zero and Kitchen Aid. 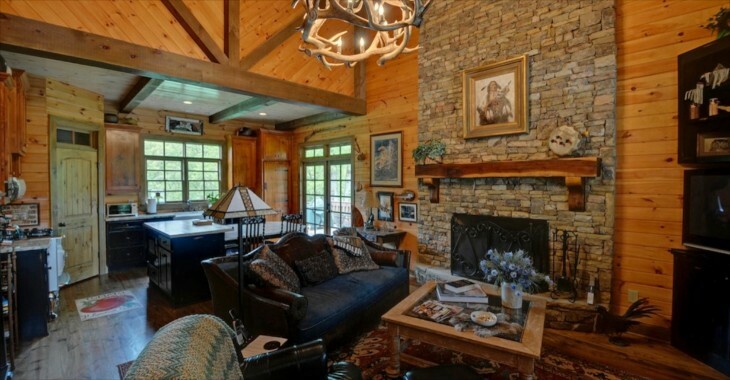 Here a brick ceiling compliments the wood and beamed ceiling of the great room……an almost Lodge like ambiance. 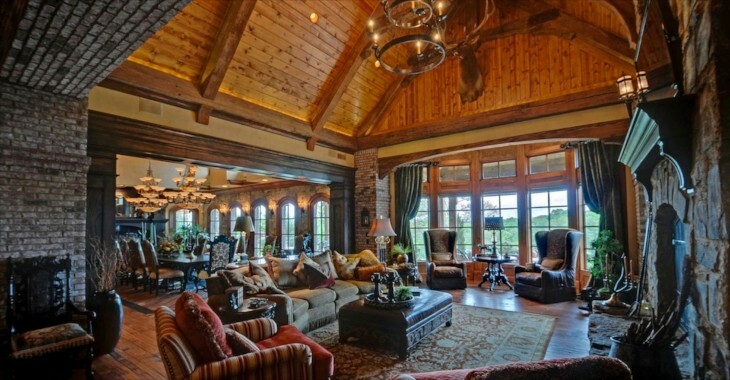 A massive stone fireplace and gorgeous cased stained wood moldings and trim around room openings. The large windows let in lots of lights and views. A unique chandelier is suspended from the dome vault in the ceiling, with another fireplace that seems to almost support the ceiling structure. Lots of cabinetry for storage. Although this is a quite large room, the architectural details make it livable. The desk is large, but there is plenty of space. Beautiful galss and iron doors lead out to one of the terraces. 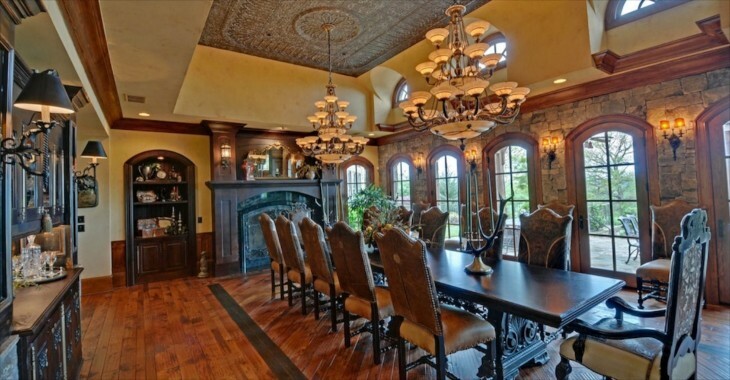 This dining room can handle a very large dinner party in style and comfort. The tall arched doors let in tons of light, and are placed along the entire length of the stone walls. A fireplace anchors one end of the room. Notice the detail in the ceiling and the two massive Italian alabaster chandeliers. Even more light can enter the room through the windows near the ceiling. Wood crown molding and trim completes this amazing space. Stone on one wall is warmed by the liberal use of wood trim and dark wood furniture. I can’t quite make out what the treatment is exactly, but the ceiling looks interesting. There is enough space for a seating area as well. Out of view is a granite fireplace. 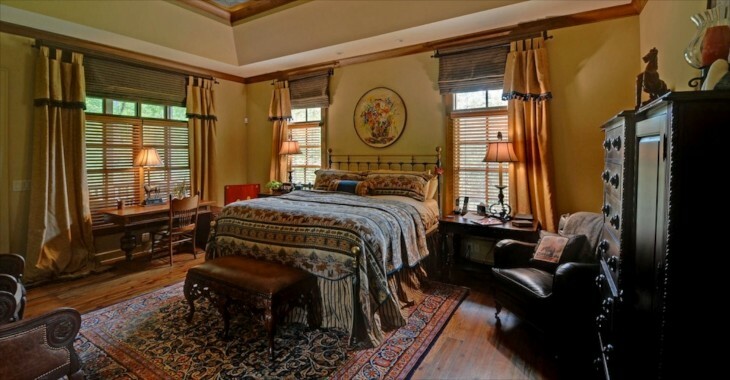 The master suite sits in its own wing of the home. 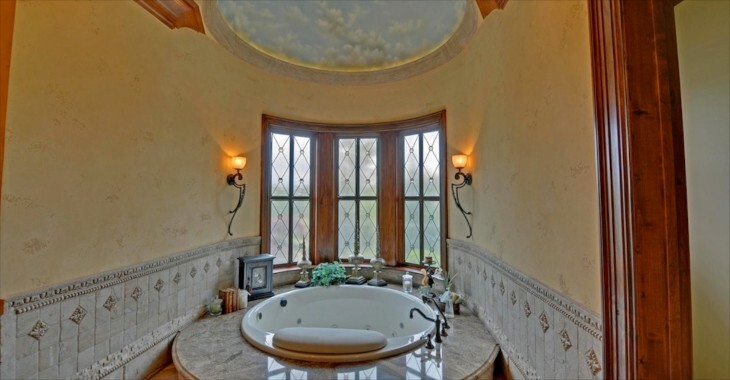 Master bath with double vanities, walk in shower with body massage features. The mirrors weight and scale is perfect for balancing all the cabinetry and wood doors. Outdoor fireplace and multiple terraces and outdoor spaces all overlook the pool and exquisite lighting details and landscaping. Fans move the air around on hot days, the fireplace warms on cold days. 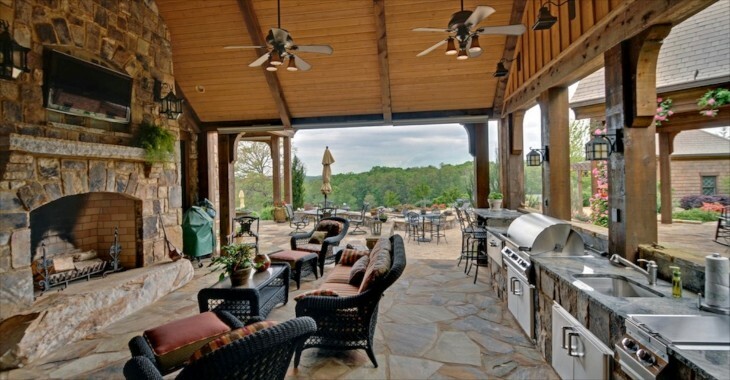 No matter….an outdoor kitchen is ready to serve hot or cold meals as well. I would live out here. Another view of the salt water infinity pool with zero entry and heated spa. 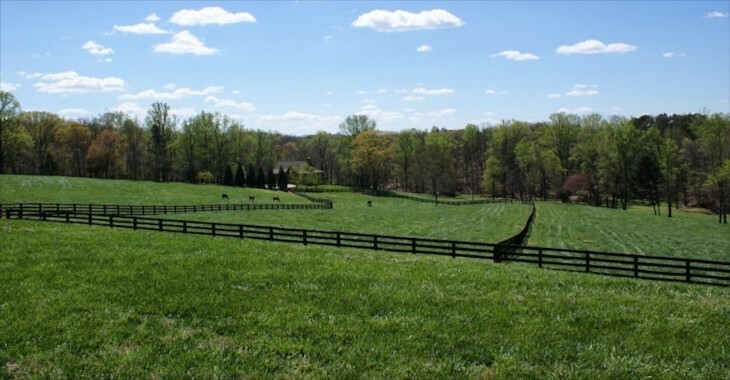 And if the house wasn’t enough, how about beautiful pastures and fencing. 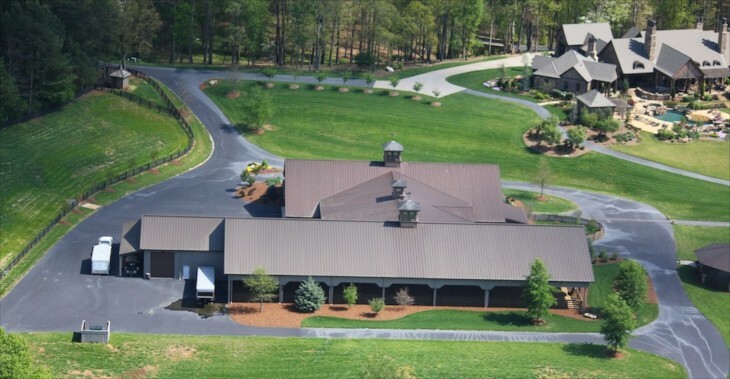 Here we see the barn and indoor arena in relation to the home. I love that the access and exit is created by a circular drive. We had one on our horse farm as well, mainly beacuse I never did learn to back up a large horse trailer. Left brain, right brain kinda thing. At least I never took down a building or fence or ran anyone over in all those years! Another view of the state of the art barn. Plenty of parking as well. You can see the round pen just to the bottom left. 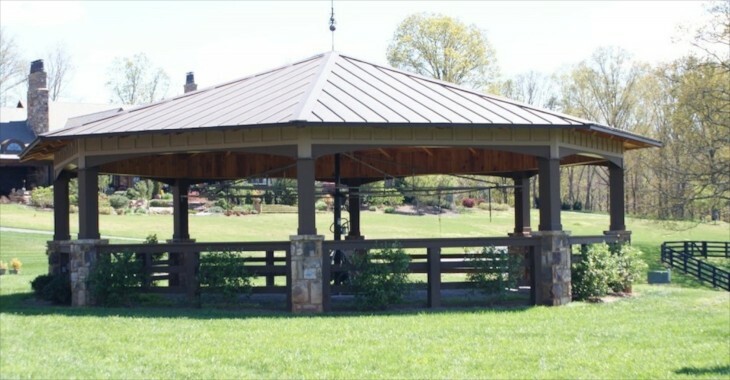 This gazebo like pen can handle up to four horses, hands free cooling because of an electric four horse walker. They need these for lazy people…..hook them up and make them walk! You can also see a covered porch that is right off the barn office. 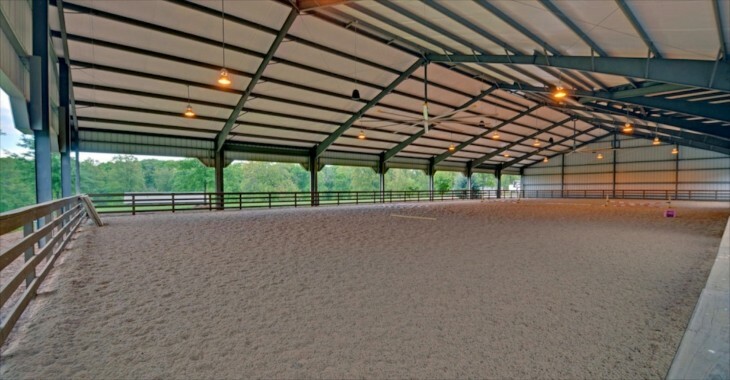 The indoor arena has multiple fans spanning 30 feet across and able to reduce the air temperature about 15-20 degrees….a good thing in the southern summers. The covered arena offers all season training. The ground surface offers an engineered, dust free polymer footing that provides lateral and vettical stability for horse and rider. Dust free is HUGE!!! I cannot tell you how often dust free matters, not just for the health of the horse, but for so much more! The arena to the left . There is also an equipment barn as part of this complex, which keeps everything nicely out of view when not in use. 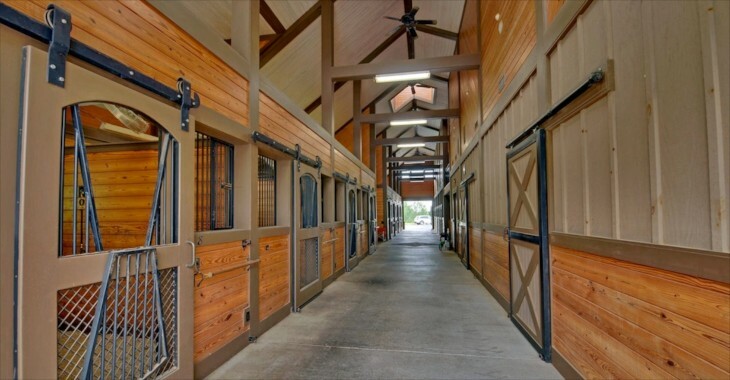 There are eight fully climate controlled wood and steel stalls in this state of the art barn. It has computer controlled water consumption indicators, as well as a timed Full-Spectrum Lighting system in place to prevent winter coats from coming in. I am pretty sure this also aids in bringing mares in season earlier as well. 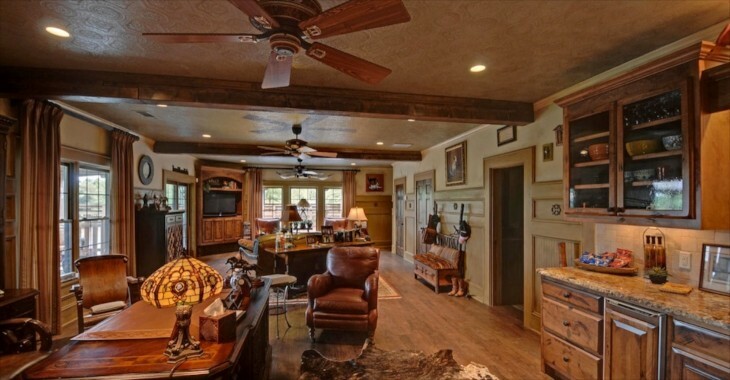 The barn also includes a farrier stall, tack room with sink, snack area and shower, feed room, laundry room, as well as a veterinarian’s office with kitchenette and additional storage for the two legged caretakers. The upstairs of the barn is unfinished. Could be used for storage or additional living space as needed. 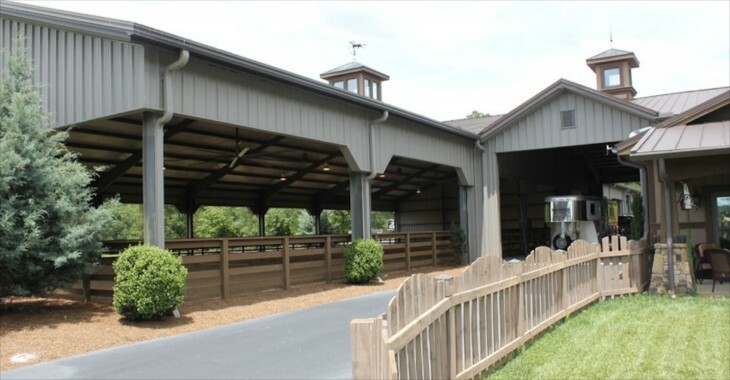 Also a part of the barn complex is an office area that includes a kitchenette, seating area, and a porch for gathering or cooling off after a ride. Closeup view of the round pen with automatic horse walker for cooling off the horses after riding. Still think it a good idea for people! Would love to have this bronze in one of my garden spaces. The view inside the guest cottage. It has one bedroom, fireplace, one and a half baths and a wrap around porch as well as a one car garage. There is also an outdoor fireplace. One of the two bedrooms in the guest wing of the manor house. The guest wing in the main house has it’s own kitchen as well. Another ariel view, but from the opposite direction. 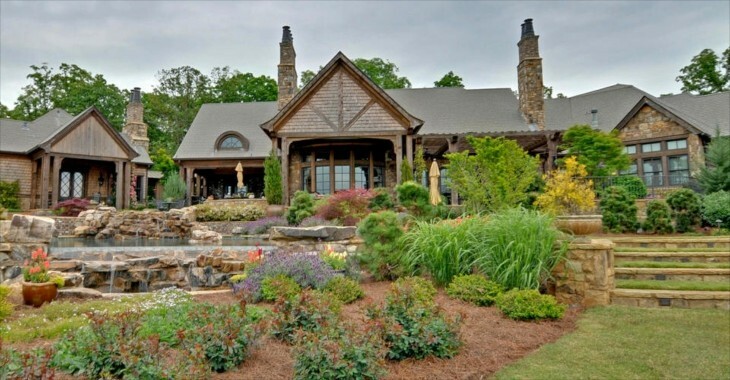 I have featured several luxury equestrian estates, but this is my favorite. I love the home, land, location and the amenities for the horses. The one in Florida was previously my favorite, but this one has the edge for now. Wonder when they announce the lottery winners. Of course, it would help if I did buy a ticket. I have never bought a lottery ticket! OMG you weren’t kidding. This is amazing..I would literally never ever leave 🙂 Fabulous..enjoy these last few weeks of summer Charisse! No, I would never leave….except to go to more horse shows! I wouldn’t leave either, except to go to more horse shows!Happy rest of the summer to you also. 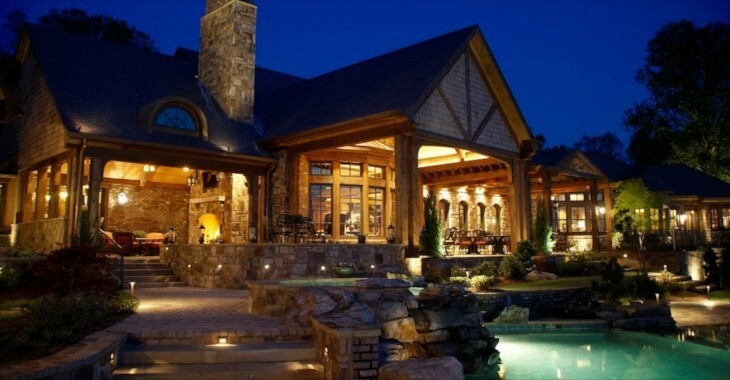 A truly magnificent property but a little too ‘brown’ for me..loved the outdoor patio and pool, though. 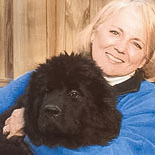 ..check out real estate website Sheelah Clarkson in Asheville, NC for ongoing neat listings from horsefarms to lake properties some are breathtaking. Yes, the home is very much done in the earth tones, and in some areas of the home my personal taste would dictate some lighter elements. Thanks for the heads up on Sheelah Clarkson. It has been a long time since I checked her site and will see what she has on the market! It is truly beautiful and yes, you are in my home territory. I love the area in the foothills, just minutes away from the mountains to the north and lake Lanier. I’m on the opposite side of the lake so Clark’s bridge is about a 20 minute ride from my home. My only disagreement – anyone who can drive to Atlanta from there in 45 minutes must be on a high speed car chase !!! and who would want to go to Hot lanta anyway when you live there! I thought of you when I came upon this farm, knowing how you enjoy that area. I agree on the driving time, unless it’s in the middle of the night. Atlanta traffic is second only to Boston and I-95 through CT.
Hi Victoria, If only!!!! very close to Carole indeed, and she loves that area as well. Hello to you and Robert!